Upstate Vegas Events: Our Dealers teach you how to play casino games. In order to get your casino night started off right, here are some quick instructions about how to play our most popular casino games. Baccarat is originally a French game, fascinating players since the 1400s. Two or more players use cards, a betting mat, and chips to play. Baccarat has rigid rules and there is no skill involved or choices to make. The game is all chance or luck. A beginner has as much chance as a professional player. The aim of blackjack is to accumulate a higher point total than the dealer, but without going over 21. You compute your score by adding the values of your individual cards. The cards 2 through 10 have their face value, J, Q, and K are worth 10 points each, and the Ace is worth either 1 or 11 points (player’s choice). 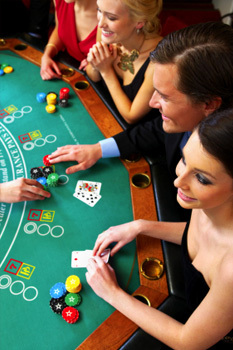 Craps, a dice game, is one of the most exciting casino games. It is common to hear yelling and shouting at a craps table. It is played on a purpose-built table and uses two dice. We call the first roll of the dice in a betting round “the Come Out roll.” A new game in Craps begins with the Come Out roll when the previous shooter fails to make a winning roll, that is, fails to make the Point or seven out. Pai Gow poker is an Americanized version of Pai Gow. The difference is, you play with playing cards bearing poker hand values instead of Pai Gow’s Chinese dominoes. The game uses a standard 52-card deck, plus a single joker. The table has space set up for six players, plus the dealer. Each player attempts to defeat the banker (who may be the casino dealer, or one of the other players at the table). Roulette originated in France back in the 17th century. It is now one of the most popular European gambling games and Monte Carlo in Monaco is a well known and famous casino centre for playing roulette. Texas Hold’em is the most popular poker game in the casinos and poker card rooms across North America and Europe. It is a community card game where each player may use any combination of the five community cards and the player’s own two hole cards to make a poker hand, in contrast to poker variants like stud or draw where each player holds a separate individual hand. Because each player starts with only two cards and the remaining cards are shared, it is an excellent game for strategic analysis (including mathematical analysis). Hold’em’s simplicity and popularity have inspired a wide variety of strategy books which provide recommendations for proper play. Most of these books recommend a strategy that involves playing relatively few hands but betting and raising often with the hands one plays.